Consumers are more curious than ever about the ingredients in the foods they purchase, not to mention where they're sourced. Recently, the U.S. Food and Drug Administration announced changes to the nutrition facts label, with a goal of making informed food choices clearer for consumers. Updated labels will take time to hit shelves, as manufacturers have until July 2018 to use the new label, and those with less than $10 million in annual sales will have an extra year. This will give consumer packaged goods manufacturers and food marketers ample time to focus on what the changes mean for their brand and their reputations. Indulgent foods that are most often consumed in one sitting will be most vulnerable under the FDA’s new labeling guidelines. Foods high in added sugars will appear on the label in grams and as a percent of the new daily value: 10% of calories based on a 2,000-calorie-per-day diet. The FDA claims that the amount of food that we consume, and our packaging sizes, have changed quite a bit since the nutrition facts panel was created in 1993. 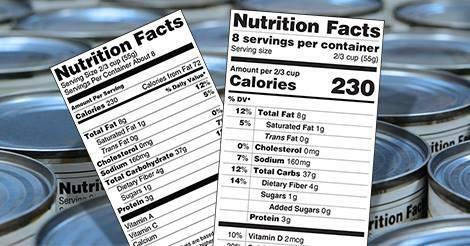 The serving sizes on the new label will better reflect the amount of food we actually eat. The 2018 compliance deadline allows CPG brands manufacturers more than two years to proactively assess and evaluate. My crystal ball shows an increase of innovation lines hitting shelves with "bite size" and "snack size" leading as a way to dull the shock factor of total nutrient counts on more indulgent items. As an integrated communications professional, it is our role to guide clients through a first step of vulnerability assessment, to proactively update materials, and address areas where the new labels will affect consumer perceptions. From there, our role is to lead discussions around product innovation, especially for brands that are high in added sugars and fall under unclear serving sizing. For example, if a product provides more than 10% of the daily value for sugar, you’ll need to respond by educating consumers on how your product fits into a total diet or for some, consider product innovation and reformulation. The biggest opportunity is to urge our internal and external clients to take the conversation beyond the bag, and to tell a broader story about food. More than ever, consumers are voracious for the facts about ingredients and why they make it to our labels, even about the brand’s partners and sources for ingredients. We have such a powerful opportunity to embark in a world of powerful brand storytelling to connect with consumers – to go beyond the label. Frani Lieberman is VP and group manager at M Booth.